As assistant site manager, my role is to aid the manager to direct trades in such a way as to help us achieve the ultimate goal of producing quality homes in a safe manner, to timescales set out at the start of the build. - What makes Essington stand out from other new-build locations? Essington is a quaint village location close to major motorway networks. Commuters like the fact it’s a stone’s throw away from the M6, M5 and M54 and there are good rail links. The local primary school, opposite our location, has recently become an academy and the last Ofsted report was ‘Outstanding’. There’s also an award-winning fruit farm and butchers, which houses a cafe and sells locally-sourced produce. There is a real community feel to the village, with regular updates on news and activities printed in the parish magazine. - What house types will be available at Essington? All the plots on this location are from our new homes collection. We have two, three, four and five-bedroom detached, executive homes. There are also semi-detached homes and 23 bungalows. We have homes for people starting out, moving up the ladder and those looking to downsize. Literally something for everyone. - How many properties will be built? There are approximately 230 plots on this site. - What show homes will visitors be able to view? The show homes under construction presently are a three-bedroom detached house, called a Spruce, and a four-bedroom detached property, called an Aspen. A Bovis Home is built by people passionate about producing a quality product and committed to delivering houses that clients will be proud to own. - How would you describe the build team at Essington? The site team at Essington is led by Adam Harrison, a multi award-winning manager with more than 16 years’ experience. 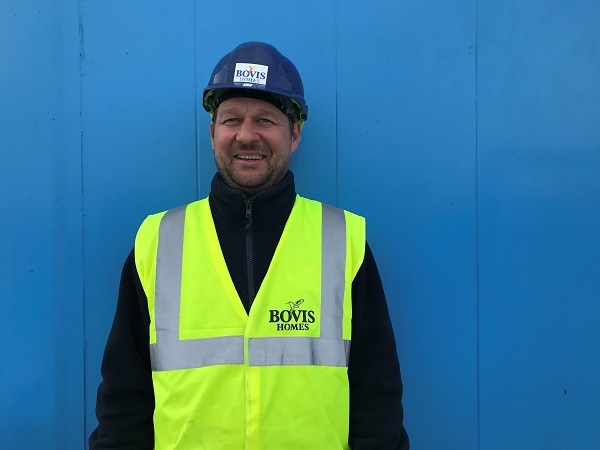 Our telehandler is Steve Caton, who’s been with Bovis Homes for five years. I am the newest member of the team, but have been made to feel at home. I like to start every day with a smile and leave the site office with one too! - What’s the next stage at the location? The site has not long started and we are yet to complete our show homes. Hopefully these will be ready in the summer. We are due to move to our permanent compound within the next few weeks. - What is your overall aim for Essington as assistant site manager of the location? My parents have lived in the village for more than 40 years. My aim is for us to leave a legacy for Bovis Homes. I hope we deliver houses to an award-winning standard, so that I’m able to drive past the completed site and be proud to say that I helped build them and of the flag that flies over them.